After a long day, the thought of retreating to the master bath has restorative powers. Creating a master bath oasis will not only improve your quality of life, it will add to your home’s resale value. To ensure you get the results you want, consider the following tips, then hire a professional bathroom remodeling contractor. Remodeling basics: Remember to build a 10- to 15-percent cushion into your budget. As with any remodeling project, master bath remodeling can come with the unexpected, especially since plumbing, electric, carpentry, tilework and more, all must be addressed in a small space. For this reason, it’s also a good idea to hire an experienced contractor to manage the many tradespeople necessary to get the job done right. Design: As with any remodeling project, planning is key. Consider your needs and desires. For example, do you hardly ever use a tub? Or is coming home to a long soak your favorite way to relax? Maybe you’d prefer a luxurious rain shower, or a steam shower for a spa-like experience. Consider that your home should include at least one bathtub, as there could be circumstances when a family member or guest will need to bathe rather than shower. Design decisions can be costly or save money. For example, keeping existing plumbing lines in place will save money. Only rearrange the location of the sink, toilet and tub or shower if it adds to the room’s functionality and aesthetics. The master bath area can also include closets and storage, and even a laundry area. Keeping clothes nearby and sharing plumbing makes practical sense. Sharing: A master bath is a space that if often shared. Plan well to make the space work for two. Considerations are double sinks and double showers, for getting ready in half the time. Plenty of counter space and dedicated storage for each person using the master bath will help things go smoothly on harried mornings. For privacy’s sake, place the toilet behind a half wall or within its own water closet. Accessibility: Incorporating universal design into any master bath remodel is a smart, and easy, thing to do. Include a roll-in shower with wide entry and built-in seating; a higher, easy-on, easy-off toilet; grab bars that match towel racks; and blocking in walls for future support bars. Size: While huge bathrooms are popular, consider that a vast space with a high ceiling can be drafty. This can be counteracted with radiant heating in the floor, or by going with a smaller, cozier space that might actually feel more comfortable. You can splurge on finer fixtures and finishes instead of opting for square footage. Durability: Bathrooms take a lot of abuse, and you can expect that any surface will get wet. Choose materials such as tile, granite and solid surface that can take it. Enamel-on-steel sinks are more durable than porcelain, as are solid surface, which can be seamlessly integrated into the countertop. Selecting colored grout for tilework, rather than white, will help keep things looking clean. Ventilation: A good fan is a must for inhibiting the growth of mold and mildew, and it will lessen the impact of water on finishes. Incorporate technology into your master bath remodel by installing anti-fog vanity mirrors and fans that come with timers or humidity sensors to automatically come on and go off. Lighting: Avoid shadows and difficulty in applying make-up by layering lighting throughout the room. Include overhead and task lighting, strong lighting for mirrors, and dedicated lighting for the shower area. Natural light can be enhanced with a skylight. Efficiency: Incorporate water efficiency into your master bath remodel by purchasing low-flow toilets, faucets, and showerheads. These contain high-pressure aerators that use less water but deliver the same performance. Be prepared for higher water and energy bills, as well as the possibility of additional drainage, when opting for double sinks and showers. Storage: Think about everything you need to use and store in the master bath – from linens to toiletries to medicines. Build in storage space for all these needs, or find furniture pieces that will do the trick. Details: As with any remodeling project, the finishing details, surfaces and materials will help make the space uniquely yours. Spend some time perusing magazines, websites and blogs devoted to design. Sign up for Pinterest, the digital bulletin board, and “pin” images that appeal to you. You’ll need to make decisions about flooring, paint colors, tile, counters, faucet styles and finishes, and more. Bring it all together with a qualified contractor. 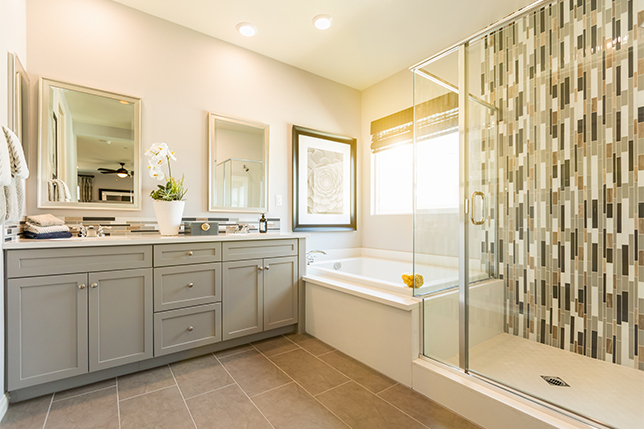 As with most significant changes to your home, the services of a professional bathroom remodeling contractor can make the difference between having the space of your dreams or a source of ongoing problems. To find a prequalified contractor in your area, simply enter your ZIP code above. All of the contractors in our network have the insurance, licensing, and experience you need for peace of mind, and their workmanship is warrantied for a three full years.